The week will include a three-day intermediate Frame Drum Intensive with 4-time Grammy Award Winner and 2014 Percussion Hall of Fame inductee, Glen Velez joined by vocalist, Loire Cotler. Asheville Percussion Festival 2019 will be held Monday June 24-Monday July 1, in beautiful Asheville, NC. Engage in a world of rhythm. Come enjoy a creative environment where percussionists, dancers, and music lovers of all traditions, gather to explore, create and innovate. The festival will be hosted by Asheville's ambassador of rhythm, River Guerguerian. This year's theme, Rhythms of Diversity, brings to Asheville percussionists from around the globe. Our Residency Artists will collaborate and create original compositions during the week, which they will perform in a Masters Concert on Saturday evening. Some of the artists will also offer workshops throughout a week-long intensive program and facilitate a sound meditation together on Sunday. This year's festival will be held at multiple locations, all within a mile from each other. Odyssey Community School: 90 Zillicoa St., Asheville, NC, 28801 - Intensive Workshops & Free Saturday Community Workshops. Rainbow Community School: 574 Haywood Rd. Asheville, NC 28806 - Marimba Workshops on Thursday/Friday. Black Mountain Museum & Arts Center: 120 College St, Asheville, NC 28801 - Gamelan Workshop and Concert on Friday. Diana Wortham Theatre: 12 Biltmore Avenue, Asheville, NC 28801 - Saturday night Masters Concert. Hyatt Place: 199 Haywood St, Asheville NC, 28801 - Wednesday Meet and Greet & Sunday Sound Meditation. Please see Ticket Description and Schedule for exact location, date, and time of each Event. Thank you. This year's festival is an à la carte menu. Create your own experience. Separate tickets are required for EACH event, including concerts and free workshops, even for intensive participants. ALL TICKETS (including intensive workshop tickets) ARE DISCOUNTED 15% UNTIL MAY 1. At Odyssey Community School: 90 Zillicoa St. Asheville, NC 28801. 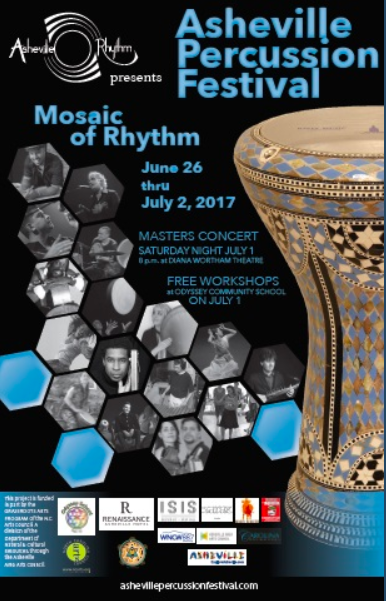 Full day intro-level intensive on Middle Eastern Drumming featuring Doumbek/Tonbak/Frame Drum with Naghmeh Farahmand. Full day all-level intensive on Handpan with Adam Maalouf. Full day intro-level intensive on West African Drumming with Adama Dembele. Full day intermediate level intensive on Middle Eastern Drumming featuring Doumbek/Tonbak/Frame Drum with Naghmeh Farahmand. Half day intermediate level intensive on West African drumming with Adama Dembele. Half day intro-level intensive on Zimbabwean style Marimba with Sue Ford & Village Marimba. Throughout the workshop, participants will learn different parts to a composition and be able to play them together as an ensemble. Instruments and mallets will be provided. *At Rainbow Community School: 574 Haywood Rd. Asheville, NC 28806. Brazilian Percussion Ensemble Workshop with Zabumba Asheville Samba facilitated by Diana Loomer and Agustin Frederic. Different types of Samba percussion instruments will be demonstrated and taught. Throughout the workshop, participants will learn different parts to a composition and be able to play them together as an ensemble. Instruments will be provided. Half day intermediate level intensive on Zimbabwean style Marimba with Sue Ford & Village Marimba. Throughout the workshop, participants will learn different parts to a composition and be able to play them together as an ensemble. Instruments and mallets will be provided. Open to intermediate percussionists with no prior marimba experience. Free Gamelan Workshop with Gamelan group Yowana Sari hosted by Michael Lipsey director of Aaron Copland School of Music at CUNY. Instruments provided. *At Black Mountain Museum & Arts Center: 120 College St, Asheville, NC 28801. Please register for this free ticket. A special evening of contemporary and traditional music featuring NYC Gamelan group, Yowana Sari. Free Community Workshops/Demos open to the public. At Odyssey Community School: 90 Zillicoa St. Asheville, NC 28801. Please register for this free ticket. Masters Concert will feature original collaborative compositions created during the residency week by our world-renowned Residency Artists. *At Diana Wortham Theatre: 12 Biltmore Avenue, Asheville, NC 28801. Concert ticket required for intensive participants. Sunday Sound Meditation - Relax and rejuvenate to the soothing sounds of Tibetan Singing Bowls, Gongs, Hand Pans, and other instruments. At Hyatt Place: 199 Haywood St, Asheville NC, 28801. Bring a yoga mat if you would like to lie down. Full day intensive on creating a Hybrid Drum Kit with River Guerguerian. Will include instruction on how to play both hand and stick drums, cymbals, shakers, and foot pedals. From simple to complex. Separate tickets are required for each event, including free workshops and concerts. For those who have attended the Intensive in the past, the price is about the same for the whole week of activities. The Saturday evening Masters Concert will take place June 29 at 8:00pm at the Diana Wortham Theatre, 12 Biltmore Avenue in downtown Asheville. The concert will feature collaborative compositions from our world-renowned teaching artists. Please allow extra time to park. For up to date information, please check the website for the most recent workshop schedule, as times of classes are subject to shift. - Writing utensil and/or personal recording device for classes and jam sessions. - Bottled water/drink and snacks. Some may be available for sale. - Yoga mat for sound meditation if you wish to lie down. There will be chairs. - A joyful willingness to share and learn about the wonderful world of Percussion! There will be vending during the Intensive week that will feature products from local and national drum makers including Cooperman Frame Drums, Carolina Drumworks Snare Drums, Meinl Percussion, Skinny Beats Drum Shop, Hands on Fire Tank Drums, McLellan Djembes, BRR Cajons. See list below. Check regularly for updates on the Schedule. If you are flying into the Asheville-Hendersonville regional airport, downtown Asheville is 20 minutes away. Greenville/Spartanburg, SC (GSP) is a 75 minute drive. Charlotte NC (CLT) is a 2 hour drive. There are many places to stay in Asheville, NC. See below for list of a variety of accommodations convenient to the Festival. We are looking forward to seeing you on this exciting weekend of percussion music! If you have any questions, please don’t hesitate to ask. Click on name for link. Our 2018 Silent Auction had beautiful and exciting things to bid on, due to our generous sponsors who donated wonderful treasures, see photos below. All proceeds go to supporting the programs that Asheville Rhythm provides. Help us grow and to continue our work to promote Wellness and Community through Rhythm. Celebrate Her Spirit, art print, 11x14 framed. Proceeds from the sale of this print will be donated to Our VOICE. There will also be a collection jar next to the print for additional funds to add to our donation. Thanks to Karen for giving us the print for this specific purpose! Please help us to give generously. Based on a design originally created for River Guerguerian, a drum similar to the one pictured, the Asheville Series snare drum by Carolina Drumworks® is configured for use in fusion kits – playable with hands as well as sticks or brushes, producing volume compatible with hand instruments, and capable of rapid changes in sound and character. Fire Works Pottery terra cotta clay bas relief, 12"x 11" yoga pose, mounted on wood frame with hanging wire. Hand sculpted by pottery artist Jim Shelly. Peruvian style Tribalscapes Music Cajon in a natural finish. The Tapa is in a two tone Moly style finish. It has a removable, and adjustable spring steel, fan style snare. Locally handcrafted by Ed Carrasquillo. Hand crafted in Brevard, NC and made to order ceremonial ritual frame drum. 22" diameter. Goat skin head. Cooperman Velez Handdance Ghaval 14” ” x 2.50” Glen Velez Series drums are noticeable lightweight, expertly crafted, and designed for use in any musical setting. They can be tuned to a wide range of pitches, while the synthetic head insures maximum resonance in any climate.